As a little boy I sometimes went out fishing in Dutch rivers and canals. The most sensational catch was that of a pike (Esox lucius). The pike looks somewhat like a barracuda with is protruding jaws and sharp rows of teeth. After a catch you had to be very careful while removing the hook from its mouth, before setting it back in the water. A pair of small pincers was highly recommended. Pikes can grow very large to about one meter, and sometimes be seen from land lying motionless in shallow water between plants, patiently waiting for its prey to pass by. It’s also a very shy fish that will dart away after spotting a human. The pike is a powerful freshwater killer indeed, but hardly a fish that will cause you sleepless nights. Not so with other ‘aquatic killers’ that have attracted the attention of documentary makers in Hollywood, and the British ‘extreme angler’ writer and television presenter Jeremy Wade. Jeremy is a friendly looking adventurous person with a feel for telling a good story. 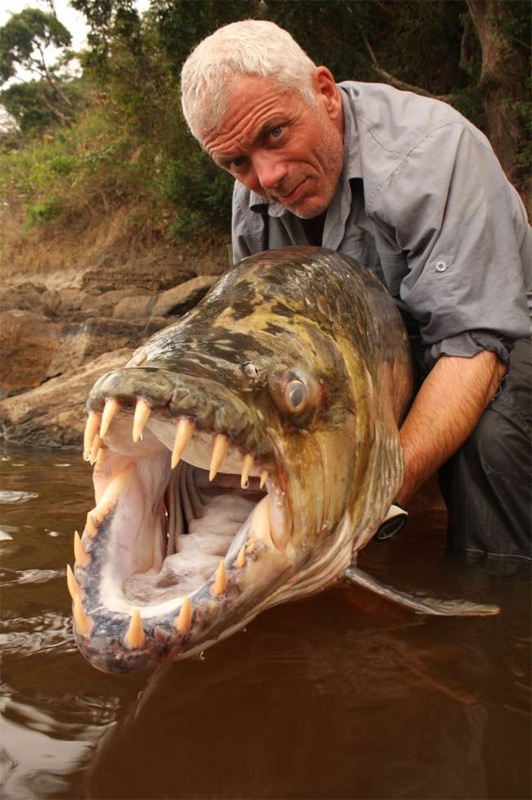 His reputation is based on River Monsters, a popular documentary television program produced for Animal Planet. In his documentaries Jeremy can be seen travelling around the globe in search of ‘fearsome freshwater killers’. * A quote from the media: ‘looking for clues, eyewitnesses, and stories about people who were dragged underwater by these vicious predators’. His talks with locals are mostly about people had gone missing in the river, or with a villager missing a finger, toe or even a limb after an unhappy encounter with a freshwater fish. Often their stories contain elements of old superstitions and fear for an unknown danger. One of Jeremy’s aims is 'to save the rare river creatures from extinction and to help people understand the truth behind the horrific attacks on humans’ . But despite these noble intentions, Jeremy also wants to make it clear that his search concerns potential killers lurking in the depth of murky rivers and estuaries. His documentaries are loaded with terms like ‘fierce aquatic killers’, ‘demons’, man eating monsters, ‘Asian Slayer’, ‘Mongolian Mauler’. They are fun to look at as long as you keep in mind that the danger aspect has been spiced up considerably. Just like numerous shark documentaries, the real-life narratives of fresh water monsters are clearly meant to inject you with a ‘healthy dose of terror’. What's real and what's myth? First, there seems to be no proof of existence of true river or lake monsters. There do exist however several kinds of scary looking fish that prowl the worlds freshwater and estuarine habitats. A famous example is the Goliath Tiger fish (see picture above of Jeremy posing with a specimen). Then we have the mega sized Goonch catfish from India and Pitaira catfish from the Amazone*. Some freshwater fish even seem to have a taste for human flesh, and occasionally bite a fisherman or bather entering their territory. However, willful attacks are very rare. Same holds for the giant Anaconda and the species that is perhaps the most notorious of the Amazone rivers: the Piranha. Despite its fearsome reputation, the Piranha is known to scavenge mainly on a mortally wounded animal and has not yet been reported actually attacking humans that venture in the water. The Candiru (Vandellia cirrhosa) is a tiny fish from the Amazone region with a bad reputation indeed. It is told to have the uncanny habit of penetrating the urethra of men and women bathers, often activated by the smell of urine released in the water. A horror story that is enough to keep your legs firmly crossed for days. But it seems that the Candirus is not responsive at all to any chemical cues. And a penetration of the urethra has only been reported once, many years ago**. Likewise , no fatal injuries have been reported in encounters with the Muskellunge or ‘musky’ a 6 feet Canadian relative of the European pike. Nor with the Alligator Gar a strange looking creature from the south-eastern United States. So what about our ‘fearsome freshwater killers’? Of course not all freshwater creatures are harmless: the crocodiles and hippos from Africa’s cloudy rivers are held responsible for many human victims every year. But clearly most material of the River Monster documentaries is not based on facts but on stories and suggestions: the fearful looking creatures could have been responsible for several mysterious drownings. So the overall picture seems to justify the conclusion that holds also for the danger of sharks: more people are probably injured each year by dog bites than by fresh water monsters.